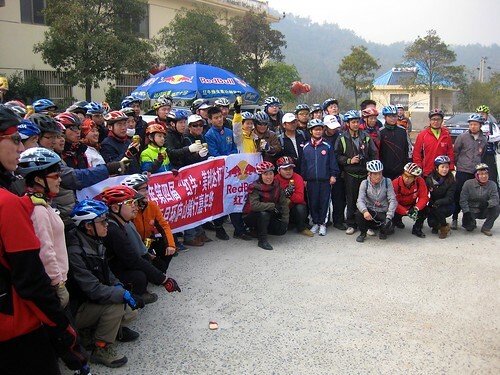 On New Year’s Day, I joined the Mount Lu Ride sponsored by Red Bull. Because of how busy I had been the last couple months, I really hadn’t been on any medium-range rides. This was a good opportunity for me to get out with some of the riders and meet some new people. 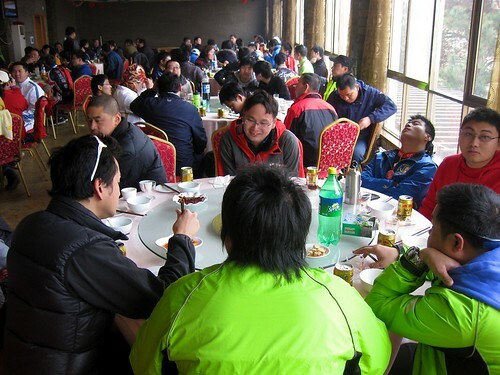 The pre-ride registration involved a lot of Red Bull drinking. Not being partial to overloading myself with stimulants, I passed on the Red Bull. But Red Bull wasn’t the only stimulant present as many were getting in their pre-ride smoke. 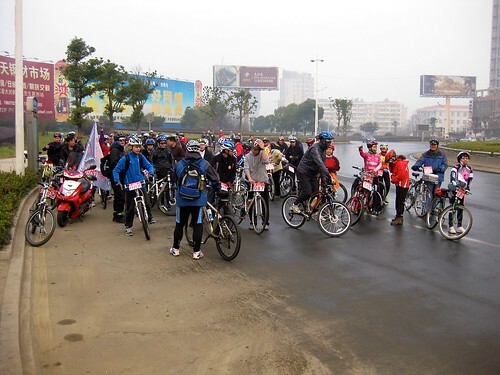 We rode as a mass group of around 150 through the city and stopped on the edge of town for a picture. Most riders were just casual riders. 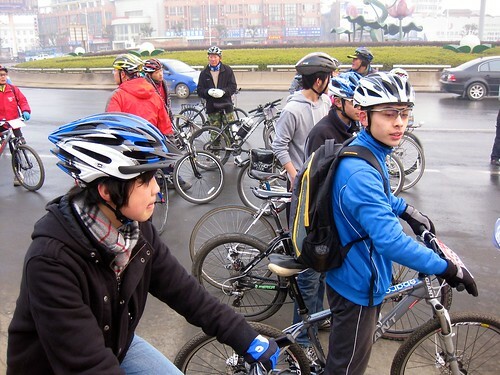 Some were high school students trying out riding for the first time. Good for them! I stopped for a second to take a quick photo of the new Mount Lu main gate. 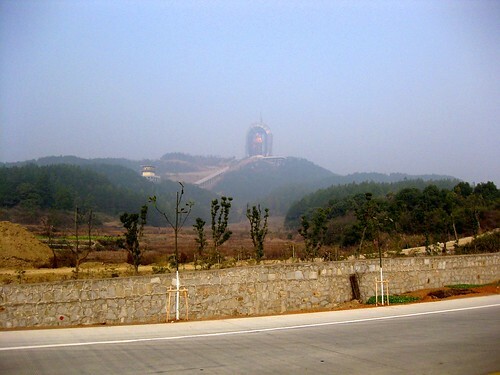 Because of the massive traffic during tourist season, this gate will allow most self-driving tourists to park their cars at the bottom of the mountain and ride buses up. 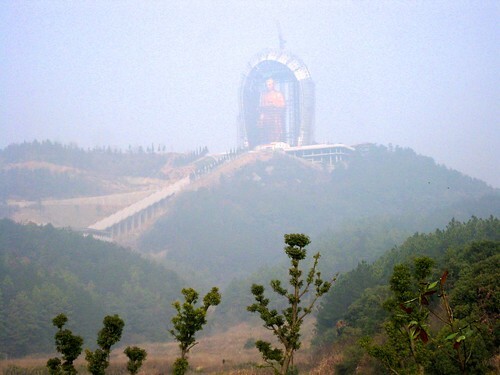 On the south side of the mountain a large statue of a buddha is being built. We stopped for lunch at a resort. 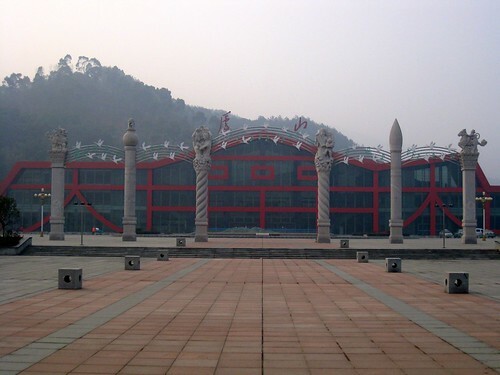 It had a large enclosed interior, though not as nice as one we had been to in Yichang. The dishes were nice, but the talk was better. After lunch, we took another pic and rode the remaining 40k back to the city. Great day!